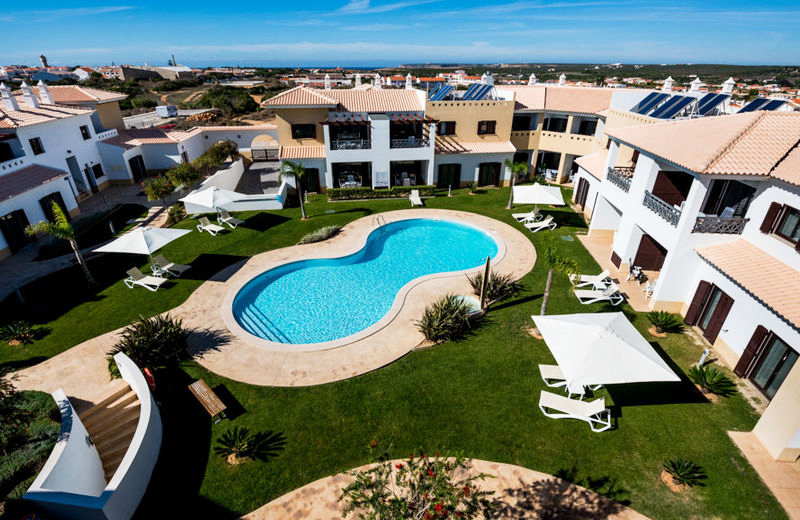 The surfcamp villa is located at the south end of the center of Ericeira with bars, restaurants and stores is also just a few minutes walk away. It takes you under 5 minutes walk to the South beach and about 15 minutes to the Foz de Lizandro beach. Where you can relax, enjoy and have fun on your holiday or choose some activities such as surf, wind surf, body board, yoga. There are a variety of accommodation to choose, from shared room to beach apartments, very comfortable and good located. we have dormrooms for up to 8 persons, mixed gender. Each bed has its locker to store savely your belongings. Accommodation includes breakfast and dinner. 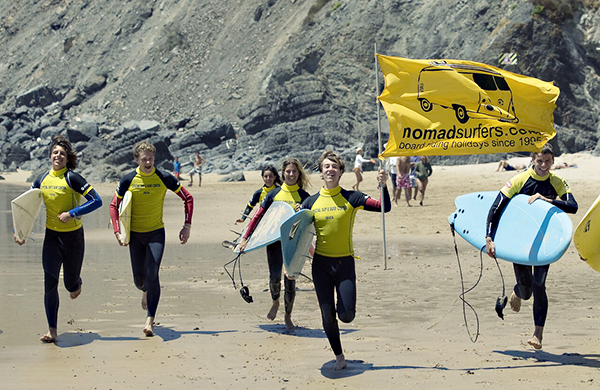 You can book your bed either with lessons, bodyboard lessons, guided boardrental or coaching. We have 3 twin-rooms, all have a little balcony with sea-view. Each room has its own theme and mural painting. The beds are made of wood-pallets and equipped with comfortable mattresses. Included in the rate is daily housekeeping, breakfast and dinner. You can book your room either with lessons, bodyboard lessons, guided boardrental or coaching. We have 2 triple rooms, both have a little balcony with sea-view. The beds are made of wood-pallets or strong bunk-beds and equipped with comfortable mattresses. We have 1 quadruple room. It has its own theme and mural painting. The beds are strong bunk-beds and equipped with comfortable mattresses. Our townhouse is located in historical center of Ericeira, 5 minutes walk from our beach, where we have lessons most often. 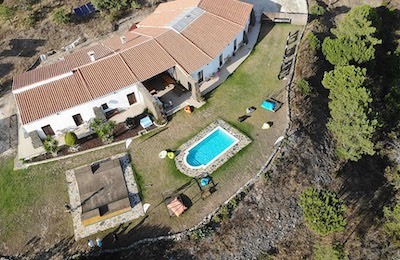 You can book the whole house (4 to 6 persons) either with lessons, bodyboard lessons, guided boardrental or coaching. Our 2 oceanfront apartments are located in the north-end of the towncenter in a priviledged location right above the beach where we surf most often. You can book the whole apartment (4 to 6 persons) either with lessons, bodyboard lessons, guided boardrental or coaching. Surf is fun!! If you surf you easily get stoked, which means your face won’t stop smiling for several days. That’s what we do and try to transmit. Surf is for all ages!! Surfing stimulates equilibrity, pushes your physics and makes you talk a lot afterwards. What a lifestyle! 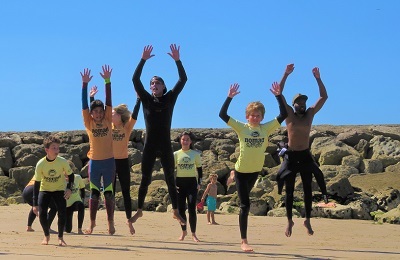 We have lessons for groms or adults and for different levels (beginner, advanced beginner, intermediate, advanced) held in small groups of 5-6 persons. Lessons last +- 3 hours, the beach depends on wave and weather conditions. Our licences to teach are for São Juliao (sand bottom), Praia do Norte (sand and flat-rock bottom) and Matadouro (sand and flat-rock bottom). Beach transfer is included in the rate. Boadyboarding is ideal for all ages specially if you are experiencing the atlantic waves for the first time. Initially bodybaording is easier to learn than surfing and therefore has a faster progress rate. If you don’t have time to spend more than a couple of days each year to catch a wave, you should try this nice alternative. We’re coaching sucessfully upcoming athelets in the age range between 6 and 18 years to prepare their skills for national and international youth competition. We also coach advanced surfers to help improve their technique and style. Sessions are held at the best spot at the best tide. We use video footage to analyse each athlets progress. This is ideal for intermediate and advanced surfers, who want to get to know the beaches of Ericeira very well. Choose any board from our extensive quiver (longboard, minimalibu, evolution, shortboard, retrofish) and surf with a local guide at the best spots and the best tides. It includes 24/7 use of equipment (board, wetsuit, leash, wax, scraper). Let us take you on a little adventure trip along our coastline. Surfaris are intended for advanced and seasoned surfers who bring their own board(s). A local guide will search with you to find the best breaks and even might take you out at some secret spots. You most likely will surf at several location on one day. Surfaris last until you are surfed out ! Soaking in the afternoon sun, watching a movie, attending a Yoga class or enjoying a recovering massage is up to you. Important is that your body and mind have time to recover from an adrenaline filled day in the water. And in the end, don’t forget, you are on holidays. The town center is just a stroll away from your accommodation. While attracting more and more people each year, Ericeira has mantained its charm and continues to be a typical South European fishermen village, proud of its long history dating back to the Phoenicians and its Charter from the 12th century. Ericeira is famous for its gastronomy and visited all year long for the fresh fish or shellfish. The time of the day when all come together to relax and talk about a long day at the beach. Enjoy our traditional Portuguese cuisine, based on fish or meat prepared by our local cook D. Ana. Dinner includes starters, main dish, desert, water, juice, sodas, beer or sangria (the later 2 only if you are over 18). Please let us know in advance if you eat a special diet. Certainly we also love to party and if you have enough energy left, Ericeira is waiting for you. Most pubs, bars and clubs are located in the center, within a short walk from your accommodation and are open until 2am to 6am, so plenty of time to enjoy our nightlife. But never forget your morning wake-up call for another day at the beach. The surf-camp villa is located at the south end of the center of Ericeirawith bars and restaurants is also just a couple of minutes walk away. It takes you under 5 minutes walk to the South beach and about 15 minutes to the Foz de Lizandro beach. Ericeira – often called the Portuguese mecca of surf – has become one of the best known surfing destinations in Europe. The town was honored as the first European surfing reserve due to the constant swells and excellent breaks its coastline offers during the whole year. We do airport transfers, you can also choose public transport (metro, bus, walk) or rent a car. We’ll send you detailed information with your booking confirmation. 5 lunch-pack, 7 breakfast meals and 5 dinners. * 24/7 use of equipment (board, wetsuit, booties, leash, wax, scraper). Except Surfari. "Great instructors and to be honest just great people. The people of the hostel create a real family vibe that is infectious to be in and around, it just makes you smile . Everybody helps everybody in this surf camp from pouring orange juice in the morning to hanging up wetsuits in the afternoon. A great place to find a chill out and get some "you time". The surf and surf lessons were great. Simply put stay here you wont be disappointed."